Rain forests provide a haven for the largest diversity of plants and animals on Earth. Join US Forest Service experts, scientists, researchers, and students and explore the tropical rain forest in the Caribbean National Forest in Puerto Rico and the temperate rain forest in Alaska and the Pacific Northwest. Rain forests provide a haven for the largest diversity of plants and animals on Earth. 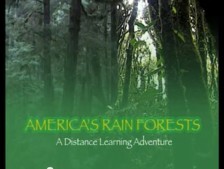 US Forest Service experts, scientists, researchers, and students explore the tropical rain forest in the Caribbean National Forest in Puerto Rico and the temperate rain forest in Alaska and the Pacific Northwest.